The Graco Modes 3 Lite Travel System stroller gives you 5 ways to ride on a sporty 3-wheel frame, signature FastAction fold and the SnugRide 35 infant car seat. Five ways to ride includes infant car seat on frame facing parent or the world, stroller seat on frame facing parent or the world, or traditional travel system. Innovative fold design lets you fold 2 ways to store the stroller with or without the toddler seat. 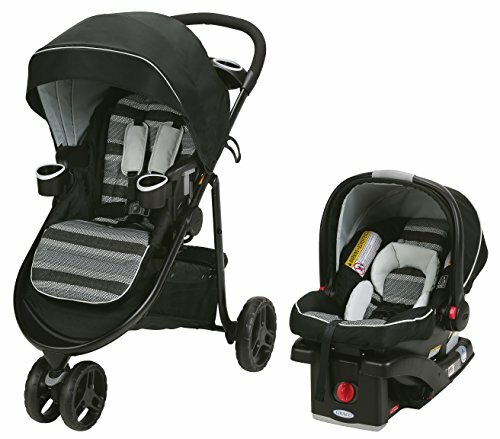 This car seat stroller combo features a lightweight, sturdy frame making it convenient to take on-the-go and makes quick, and long, trips with baby easier! Multi-position reclining for child's comfort; two pivoting child cup holders to hold snacks, drinks or treasures; stroller holds child up to 50 lb.